Millions of dollars in funding and billions of dollars in valuations have made scooters the next big thing since the last big thing. When Michael Ramsey, an analyst for technology research firm Gartner, started in February to put together his 2018 “hype cycle” report for the future of transportation, he had plenty of topics to choose from: electric vehicles, flying cars, 5G, blockchain, and, of course, autonomous vehicles. But one type of transportation is conspicuously absent from the results of the report: electric scooters. In a matter of months, electric scooter startups have gone from tech oddity to global phenomenon. 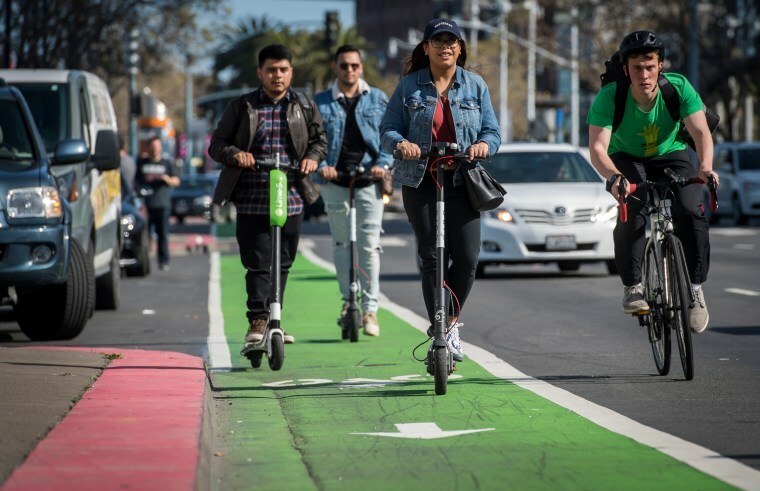 In some cities, hundreds of scooters suddenly showed up on streets from companies including Bird and Lime, leaving municipalities to figure out how to handle the sudden influx of two-wheeled travelers. The concept behind the scooters is simple: A user can grab any available scooter, unlock it with an app, ride to their destination, and leave the scooter there for someone else to use. Even by the hyper-growth expectations of Silicon Valley, the rise of scooter companies has been dizzying. Scooters can be found in more than 125 cities in the U.S. and more than 10 across the globe. In the year after their launch, both Lime and Bird said their scooters had been used for more than 10 million rides. “We’ve seen other companies grow at amazing rates, but this is kind of unprecedented in how fast they were able to get to even a million rides,” said Sunil Paul, founder of one of the original ride-sharing services, Sidecar, which eventually yielded to Uber and Lyft. Consumer adoption has been met with wave of investment that has made Bird and Lime some of the fastest companies to ever reach a $1 billion valuation — what Silicon Valley calls a “unicorn.” The two companies have raised a total of $882 million in funding since 2017, according to startup tracking platform Crunchbase. The dizzying rise has surprised even some of the scooter industry stalwarts. The concept has even ride-hailing giants Uber and Lyft rushing to catch up. Lyft is testing scooters in Denver, while Uber’s can be found on the streets of Santa Monica, California. Scooter companies, however, are not without their challenges. Cities — having learned from growing pains with Uber and Lyft, which also launched with little regard for local regulations — are pushing back against the scooter influx. San Francisco, the epicenter of the scooter boom, issued a temporary ban on scooters in June. Last month, the city granted only two permits for on-demand scooters to operate in the city -- Scoot and Skip, smaller players in the industry. Uber, Lyft, Bird and Lime were among major players that were denied permits. Some parts of Los Angeles have banned scooters, and Denver seized scooters and issued fines before issuing permits under new rules. Issues with city officials are less of a speed bump than the technological challenges of autonomous vehicles, though scooters don’t tend to fare well with speed bumps. Scott Kubly, chief program officer in charge of Lime's government relations, previously the director of Seattle’s Department of Transportation, said scooters are serving an immediate need that cities can’t necessarily fill. From relieving traffic congestion to making transportation more affordable, equitable, and greener, Kubly said the disruptive new travel mode can help cities meet policy goals they have had for years.